Sometimes in life we have a vision, and the path to achieve the dream is uncertain. I am taking an opportunity, following a new path, in order to fulfill my goal, to share my art with people, and teach adults to play freely, reconnect with the child within, and give up perfectionism, if only for a moment in time. It is with mixed emotions that I am announcing an end to my offering for Traveling Paint Parties. (You will notice the page no longer exists). I am in love with the idea of bringing painting to people and sharing my passion for creative expression and playing with colour. I have been offered an opportunity to share this passion with a larger audience through Cocktails n’ Canvas, by teaching local social painting events. I am so excited to be joining this amazing team of artists! As many of you know, and some may not, I got my introduction to acrylic painting with Cocktails n’ Canvas. 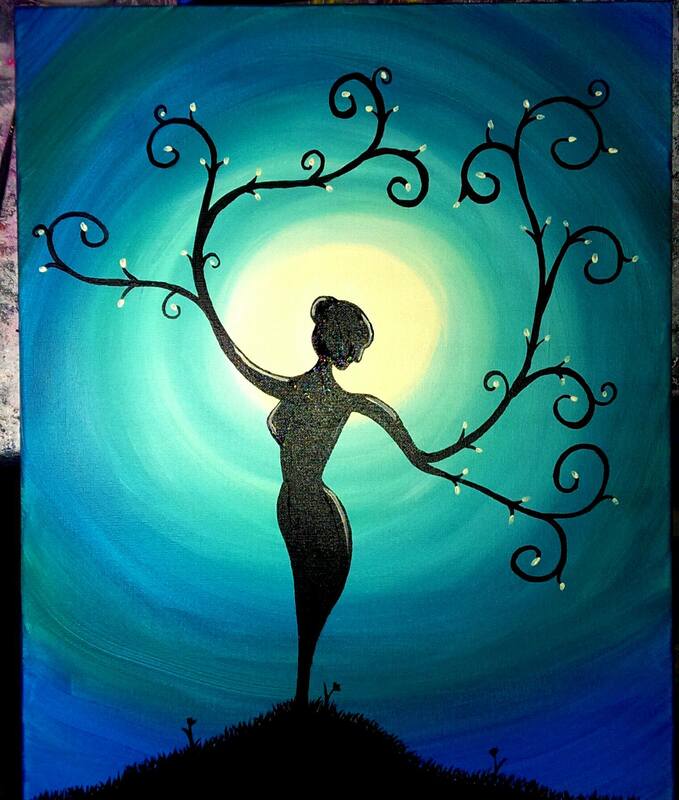 I harnessed my courage and went to a restaurant with a few friends, and learned a painting. What really struck me was the freedom of “anything goes”…”there is no wrong”. As I focused on the experience and took pressure off of the final product, I fell in love with my painting. I was very proud of it, and of myself, for the first time in quite a while. I mixed all of those colours. I may have followed step by step instructions, but it was my hand that painted it. A sense of individual style was present, even then. Everyone in the group had the same instructions, and yet, every painting was unique…and gorgeous! This person’s colours…that person’s brush strokes…and another person’s blending…it all fascinated me. I had to do more. So I bought paint, and sought out videos online, online classes, and more Cocktails n’ Canvas events. The experience ignited a missing flame inside of me. It changed my life. And now, I have the opportunity to give back to Cocktails n’ Canvas, and share this experience with my community. I believe we are all artists when we are creating. We all have a unique outlook, and if we free our inner child we can feel the rush of joy and excitement in our play. So although it is sad that I will no longer be planning or hosting my own paint parties, I am excited to be traveling along this new path with Cocktails n’ Canvas. Did you know that Cocktails n’ Canvas hosts private events as well as public events? Held at one of their venues or at a location of your choosing. 🙂 If you’re interested, especially as the holidays approach, check out the “Create Your Own” tab for private events. Looking for a painting event for yourself and a few friends? Check out the events listing. Thank you for all of your support an encouragement! I look forward to painting with you! Above, please find a painting that will soon be available for Cocktails n’ Canvas events, created by me! (Sorry for the flash…) Cheers! Great article! Good luck in your new venture. I wish I knew which direction I was taking with my art! Thanks Louise! Keep doing what you’re doing with your art, and watch for doors to open. It will happen. Be patient. And go for it!